I was recently presented with an interesting conundrum. Can you generate an INSERT statement for data that currently exists in a table? The original request was to generate an insert script for all rows and all columns in a specified table. The insert script was going to be part an installation process where a table was to be pre-loaded with data. But, if I was going to go to the trouble of writing a program, why not expand the requirement so it would generate the insert script based on an SQL statement as opposed to all rows and columns in a table? By using a select statement, we can reduce the number of rows and columns in the insert statement and, if required, replace column values with constant values. Such a script would provide an excellent means of generating test data from live data and giving us the option of not copying sensitive information. 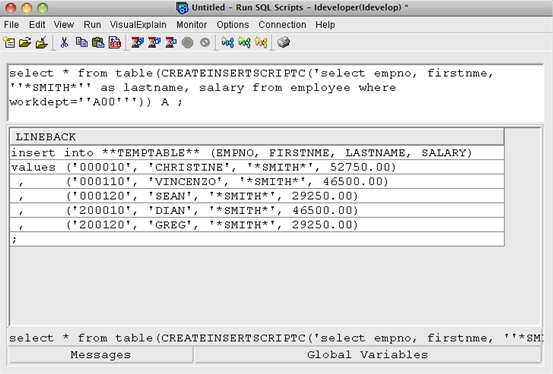 The solution makes use a table function (CREATEINSERTSCRIPTC) that calls an RPG program (DESC22) that makes use of SQL Descriptors. If table functions and descriptors are a bit daunting, the good news is that all you have to do is compile the provided program, create the table function and you are ready to go. 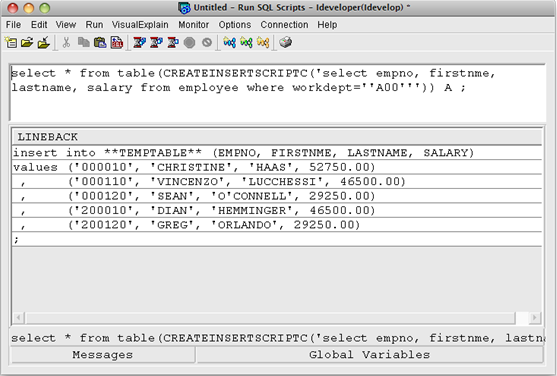 This is how the insert statement is generated by calling the table function. The result set can be copied and pasted into a source member of my choice. Not all columns are selected. Not all rows are selected. The literal value for the WHERE clause is enclosed in two single quotes (as opposed to one). This is how you include a single quote in a literal. The SQL statement, passed as a parameter, can be as simple or as complex as required–join multiple tables, group by, order by etc. The following example is, basically, the same as the previous example except that I have replaced everyone’s last name with a constant value. The function is passed a single parameter (FORSTATEMENT), which is the required SQL statement, and returns a table with a single column (LINEBACK), which contains a line of the insert script. Both of these variables need to be large enough to cater for the size the SQL statement and the size of a row of values. Remember, the sizes of the variables are defined on both the function and in the RPG program. When a table function is used in an SQL statement, the underlying external program is called numerous times–an initialization call and once for every “row” returned until all rows have been processed. The type of call (initialization, fetch, etc.) is indicated by a Call Type parameter. A: The definition of the parameters must correspond to the definition for the parameters in the function. B: The program sets SQLState to 02000 to indicate to the caller that all rows have been processed. C: The call type parameter indicates whether it is an initialization or fetch call. D: gv_types is an array used to store the data type of each column in the select statement. The type is used to determine whether or not a value should be placed in quotes in the generated insert statement. E: It is always a good idea to give meaningless values meaningful names. F: On every call to the program, the relevant subprocedure is called, based on the value of the call type parameter. Validate and prepare the requested SQL statement. Use a descriptor to retrieve descriptions of all the required columns. Build an array of data types of all of the columns. Use the descriptor to specify that all values are returned as VARCHAR (more in a moment). Build the first line which is returned. This is the INSERT line which contains the names of the columns being inserted. This line is not returned on this call but on the first call to doCallNext(). A: Allocate the descriptor that will be used in processing the requested SQL statement. B: Copy the passed parameter to a work field. The passed parameter is defined with the CONST keyword, which means it cannot be used in an embedded SQL statement. C: Prepare the requested statement. Processing will only continue if the statement is OK.
D: Describe the prepared statement with the descriptor and retrieve the number of columns in the select statement. E: Construct the start of the first line returned. F: Loop through each of the column definitions and retrieve the data type and name of each column. G: Add the column name to the list. H: Store the data type of the column. I: Use the descriptor to specify that the column value is to be cast as VARCHAR. When using SQL descriptors to retrieve column values, the rules are very strict in that the definition of the host variable must match exactly the definition of the database column. By casting to VARCHAR we can use a single host variable to retrieve any column value. J: Declare the cursor for the prepared statement and open the cursor. K: If there was a problem with the requested statement, return an error to the caller. On the first call to the subprocedure, the first line (prepared in doCallOpen()) should be returned. When all rows have been processed, a final row with a semicolon needs to be returned. When adding column values to the returned line, we need to cater for values that must be enclosed in quotes and for null values. A: If this is the first call, return the line that was constructed in doCallOpen(). B: If all rows have been returned, set the End of File condition and end. C: Start constructing the returned line. D: Fetch the next row from the prepared SQL statement. E: If all rows have been processed, return the final ‘:’, close the cursor and de-allocate the descriptor. F: When processing a row, loop through each of the requested columns. G: For each column, retrieve the data for the column and the null indicator. H: Use the previously stored data types to determine whether or not the value should be enclosed in quotes. I: Determine whether or not the column is null. J: Add the value to the line to be returned. Finally, the doCallClose() subprocedure is called when the client makes a close call to the program. The doCallClose() subprocedure closes the cursor, deallocates the descriptor and end the program. At first I thought of doing this using a stored procedure. The problem with a stored procedure is that the program would need to generate all of the result set before returning to the caller. The row at a time processing with the table function made it easier to write. If copy and pass (of the result set) is too much of a chore, you could write a “wrapper” program that would put the result set in a source member or IFS file. Hopefully, this is another tool you can add to your utility belt. Enjoy! this is a great tool. Thanks for sharing it. If an alphanumeric field contains a singlequote, it is not converted to two singlequotes. See your sample above (O’CONNELL).